It has come to the notice of Ministry of Petroleum and Natural Gas that Some unscrupulous persons by using name of Ministry of Petroleum and Natural Gas have advertised for appointment of petrol dealers under a non-existing scheme “Jawahar Rojgar Yojana” and collecting substantial amount from applicants. It is clarified that Ministry of Petroleum and Natural Gas has not issued any advertisement for allotment of petrol pump under scheme by name Jawahar Rojgar Yojana. It is informed that Ministry of Petroleum & Natural Gas has no role in appointment of dealers. Three Oil Marketing Companies i.e. Indian Oil Corporation Ltd. (IOCL), Bharat Petroleum Corporation Ltd. (BPCL) and Hindustan Petroleum Corporation (HPCL) based on their feasibility study, identify the location and issue advertisements for appointment of dealers as per existing selection guidelines. 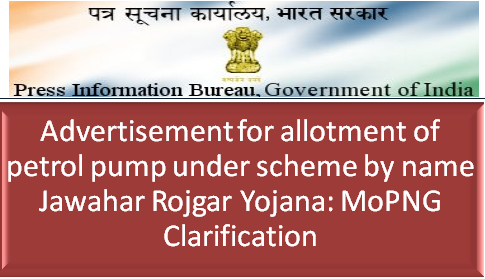 It is further clarified that neither Government of India nor OMCs have advertised for appointment of dealer under Jawahar Rojgar Yojana. Prima facie, it appears that some unscrupulous elements are misusing the name of Government of India. General public are accordingly advised not to respond against any such advertisement/scheme. Some unscrupulous persons by using name of Ministry of Petroleum and Natural Gas have advertised for appointment of petrol dealers under a non-existing scheme “Jawahar Rojgar Yojana” and collecting substantial amount from applicants.